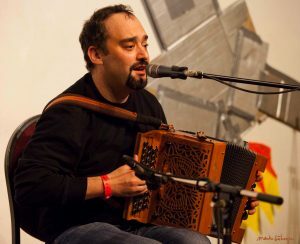 Lincolnshire, for a live concert featuring Italian melodeon player Andrea Capezzuoli, along with members of Banter (Tim Walker, Nina Zella and Simon Cale). We’ll be streaming live on our Facebook page. Andrea is an amazing melodeon player with a huge repertoire of tunes and some songs from all over Europe and a deep love of Québécois (French Canadian) music too. He regularly has Nina flying over to Italy to play with him and plays at many major festivals in Europe. 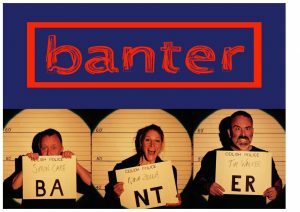 He was scheduled to play with Banter at a concert in Sherringham tonight, but due to unforeseen circumstances that gig has been cancelled. The concert will start at 7:30 UK time, with tunes from Nina and Andrea, songs from Nina with Tim accompanying and some of our favourite Banter tunes from Nina, Tim and the ever cheeky Simon Care. If you enjoy the stream, we’d like to suggest a donation of £5, as this will help take some of the sting out of Andrea’s air fare. This entry was posted in concert, on the road. Bookmark the permalink.